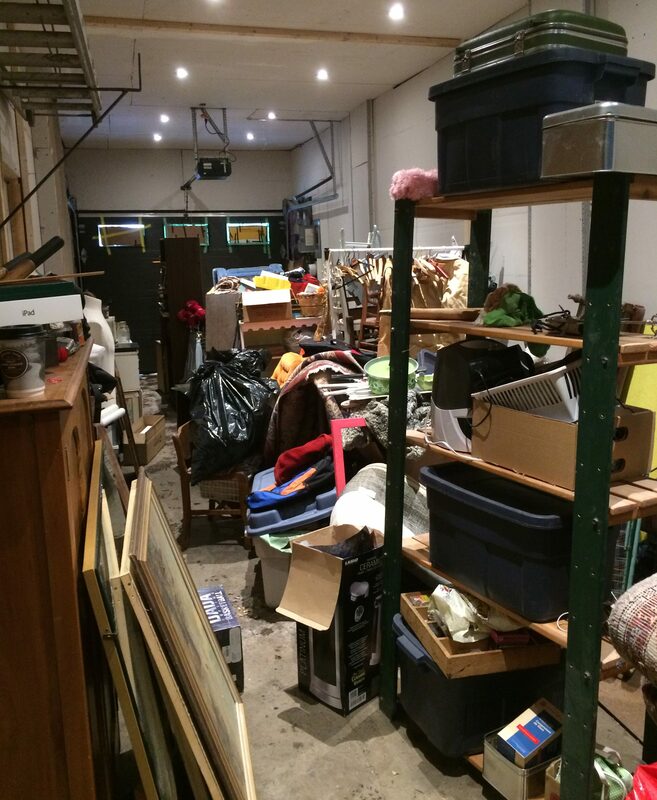 I moved all my junk into the new garage space a few weeks ago. I was helped by the former tenant who now occupies my old garage. The transition wasn’t all that hard thanks to a door connecting the two spaces, but because we were in a rush (he had a fancy car in there and wanted to move it before the snow came later that night) the placement of my products wasn’t well thought out. I’ve gone back a few times since then to move things around. The garage now looks much better than it does above, though it’s still a work in progress. I have a lot more space to work with now, and I’m hoping the extra expense (300$ total, or 200$ a month more than the other garage) ends up being worth it! One of my main goals for the garage is to set up a little photo studio so I can get quality pictures of my trash. 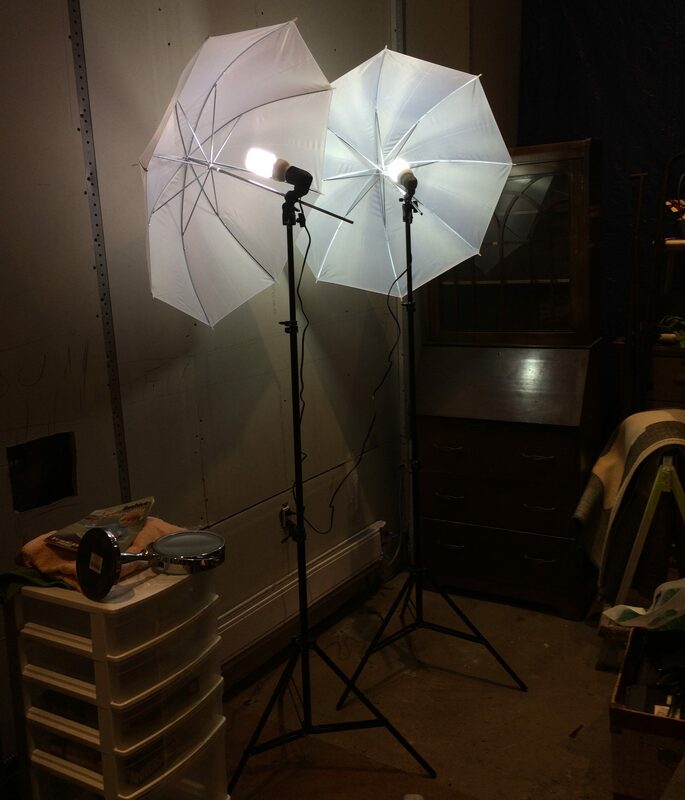 Lighting is key for good photos, so I bought these two umbrella things off eBay in hopes that they’d do the trick. They seem well made, but the light output isn’t nearly strong enough for my purposes. I might just need to buy a couple more to get that optimal light, but if you have any advice let me know! My dream is to be able to take large group shots at a level of quality near what I can achieve using my light box at home. I haven’t found much good trash lately, in large part because of the harsh weather, and the stuff I did find won’t be documented until I get that light situation figured out. 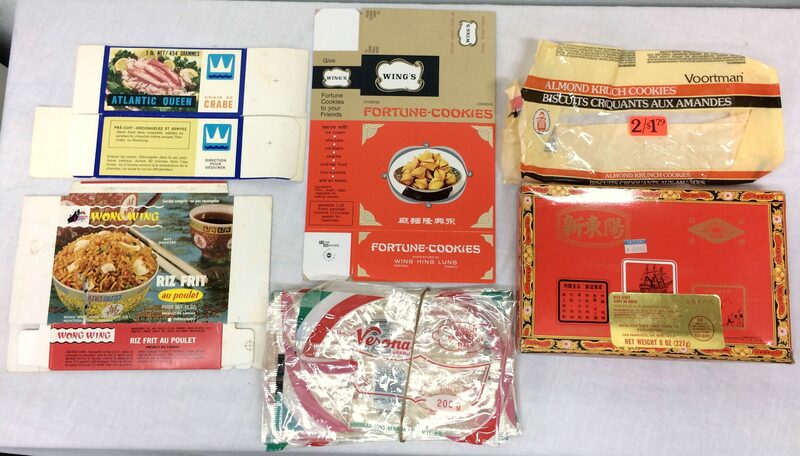 So, I figured I’d share one of my more unusual finds from the summer: a large collection of vintage Chinese food-related items, and fortune cookies in particular. 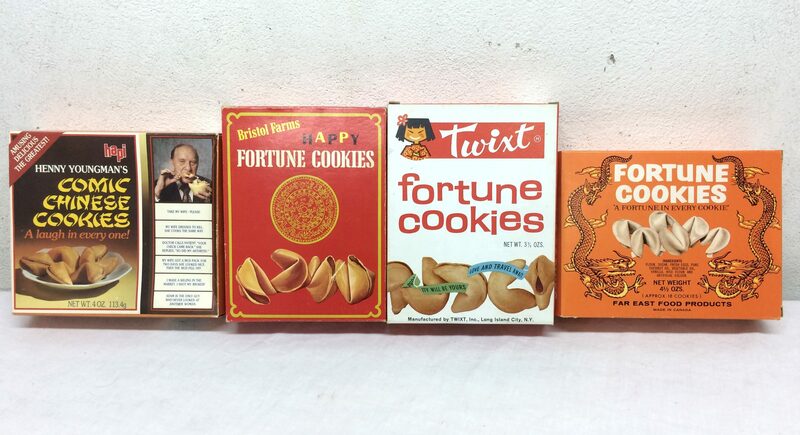 One box I saved was stuffed with empty fortune cookie boxes, most of which look to date from the 60s-80s. For the record, this all came from that spot where I was eventually yelled at by an angry guy with a dog. (FYI, these photos were all taken at my old garage until mediocre light. They look okay, but if you zoom in the details aren’t that great). I expect there’s a collector, or maybe a researcher out there who would be interested in these! They’ve been sitting in my garage since the summer, but maybe I’ll finally do something with them soon. The collection could make for a fun eBay lot. 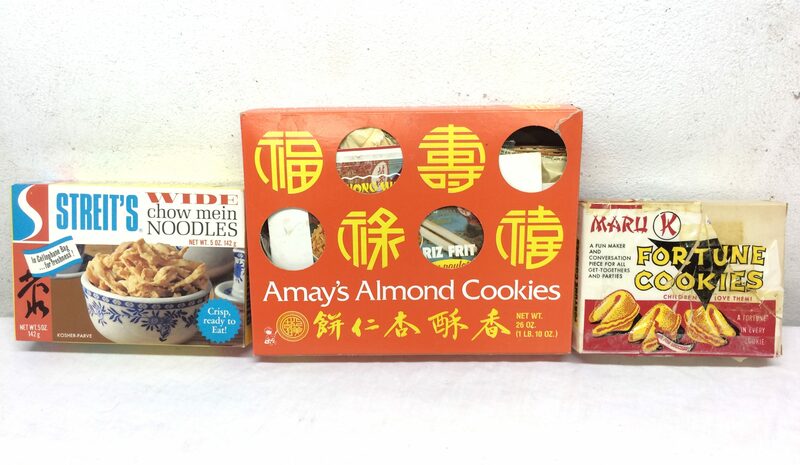 That Amay’s Almond Cookies box was loaded with other smaller, flattened boxes. 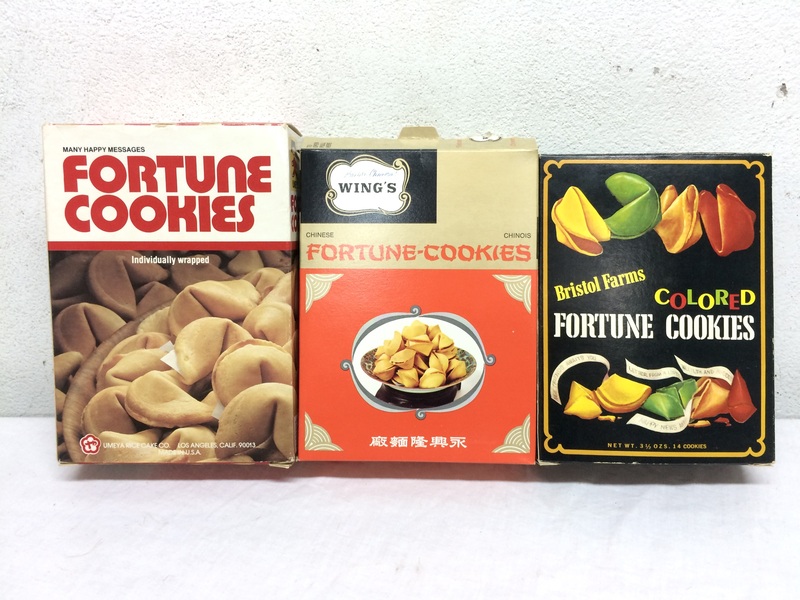 I also found a small box full of actual fortune cookies, which like the boxes probably dated back around 30-50 years. I wonder how they’d taste? I’d guess not good. These were the biggest fortune cookies I’ve ever seen. Unfortunately, like the others they’re quite stale! Of course, what fortune cookie collection is complete without some actual fortunes? My favourites are the ones that look hand-typed. Zoom in for a better look at what they say! 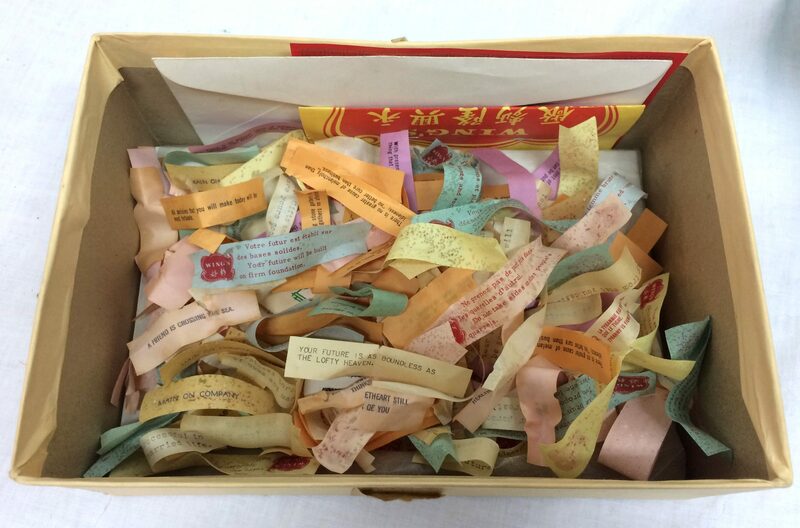 My favourite part of this collection is yet to come, however – five scrapbooks full of old Chinese restaurant related ephemera, including clippings of ads and articles from magazines. I’ll show you that sometime in the near future! In other news, the bakelite bead auction I started last week did exceptionally well, ending at a mind boggling 1,141$. I won’t celebrate too much until I actually get paid (I haven’t yet, but I assume that’s normal for a transaction that big) and the package is successfully delivered, but I am cautiously optimistic. I wasn’t expecting anywhere near that amount, otherwise I would have listed it years ago! The other two auctions were duds – the items did sell, but at their original listing price – but this result would more than make up for that. Anyways, the weather for this week is looking a bit nicer (though the rain sounds kind of gross) and hopefully the finds will be more plentiful. I’ll keep you posted! Wow, I’ve seen lots of different collections but Chinese food items takes the cake. Would would have thought! Good luck with your new space..and your lighting! Would it help if you hung white sheets to make a smallish room in one corner of your space? It would reflect more light, the same way a small light box does. That might help yes. I probably still need more light though. Wow! That bakelite auction!! Congratulations! Do you buy extra insurance on your package? I have had great customer service from U-Pic. For high value items I usually insure, if not for the full amount then a partial one. For this, I would probably do the full amount because it’s going to Turkey and I have no idea how well their postal service works. For low value I never insure (or at least past what Canada Post gives you anyways), I figure it’s a waste of money. I’m not sure U-Pic works in Canada. That’s a much better looking garage space, I think. I think jenny_o’s “sheets” idea sounds promising. Love those older fortunes; the ones nowadays don’t have the same charm. It’s a lot bigger that’s for sure. Lots more vertical space too. I doubt my cookies get anywhere near that total, lol. Wow. 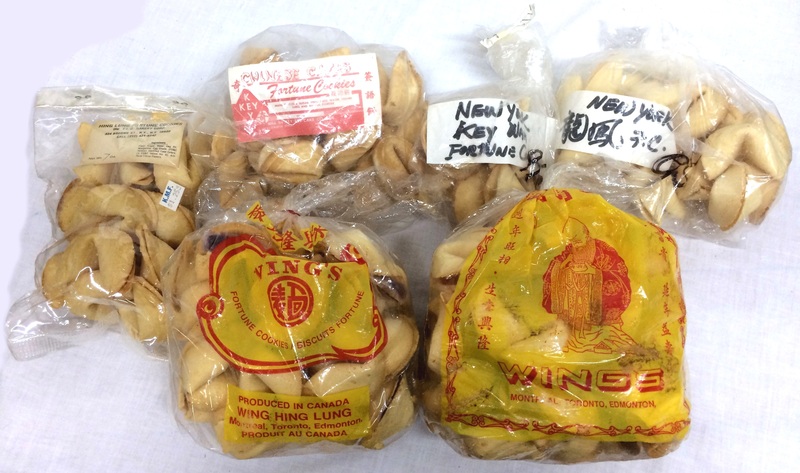 What an interesting collection of materials related to Chinese food (in Canada, I guess). 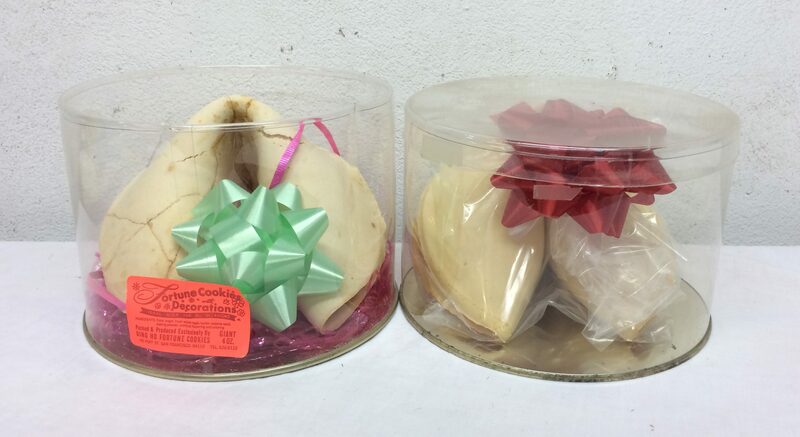 I have never seen such large fortune cookies!!! And hurrah for a successful bakelite bead auction. I hope the payment arrives successfully. Even poor neighborhoods produce some good trash.I was visiting someone in Hochelaga Maisonneuve near metro Joliette.Just opposite metro Joliette on Hochelaga street ,someone this week had thrown a beautiful kitchen table out with the trash.Walking on Cavalier street and Aylwin street I saw a nice lamp and a nice candle holder in the trash.Luckily,the kitchen table had been taken by someone when I walked back to the metro two hours later. Even in poor neighborhoods like HOMA ,a number of residents have had homes or apartments for decades and they discard vintage stuff on occasion. It’s true, you just generally have to be in the right place at the right time (because there are lots of other pickers too in these neighbourhoods). I’ll cover these areas occasionally to see if I get lucky (I do notice things, or take things that other people would not) but overall I leave the poorer areas for the locals. I love reading your blog and read about your Chinese cookie boxes’ finds with fascination.Very,very interestingly you mention it was fromthe same home where an angry guy with a big truck and a ferocious dog scared you off. But you could still go to the same place and grab the boxes they throw in the trash and sort through them later in the car. I might do that in an extreme circumstance (ie: I know they’re throwing out awesome / unique stuff) but in general I would avoid that because it makes a more serious confrontation more likely. People do stupid things all the time, and I prefer to avoid egging them on when possible. Wow, that takes the cake. Fortune cookies desirable? Is it the presence of the cookies (not for sampling, I realize) or it it the old fortunes? About your lights, I bought those same lights & they definitely don’t deliver enough. I also bought a white backdrop, which helps. I think one of those lights that swings above the object (overhead) is necessary. I’m talking the kind you have to anchor with a sandbag. I don’t have it b/c I don’t have the room, but wish I did. I still have to use flash & photo editing to come out with decent photos. I have no idea if they’re desirable actually. I hope they are. I could see someone interested in the history of Chinese food in North America being interested in them perhaps. The boxes might also make a cool display. I think you’re right about the overhead lamp. I’ll look into that. and you’ll see a vast array of examples. Enjoy reading your posts.